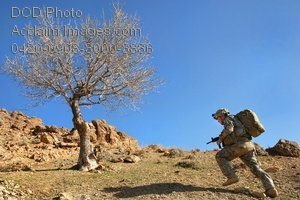 Description: Free, public domain image: US Army Soldier Running Up a Hill in the Desert. U.S. Army Pfc. Brandon Luff, assigned to Bravo Company, 1st Battalion, 4th Infantry Regiment, U.S. Army Europe, climbs a mountain ridge while on a dismount patrol near Forward Operation Base Lane in Zabul province, Afghanistan, March 8, 2009. (U.S. Army photo by Staff Sgt. Adam Mancini.